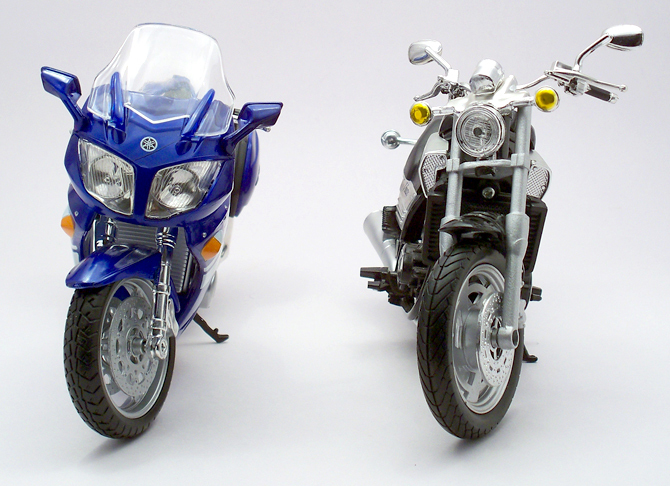 Yamaha Motor Company is known for its light weight motorbikes; known for its handling and performance. 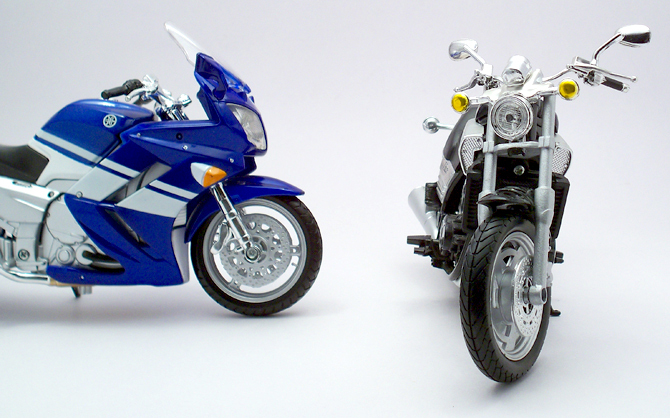 Bikes like FZF R1 and R6 are known for their nimble on track performance and agile on road performance. 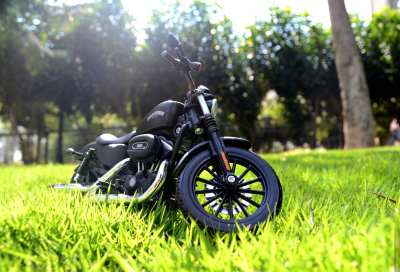 They are also into scoters, some heavy cruisers like V-Max and touring bikes like FJR, though designed for different purpose but have a lot in common let’s check it out. 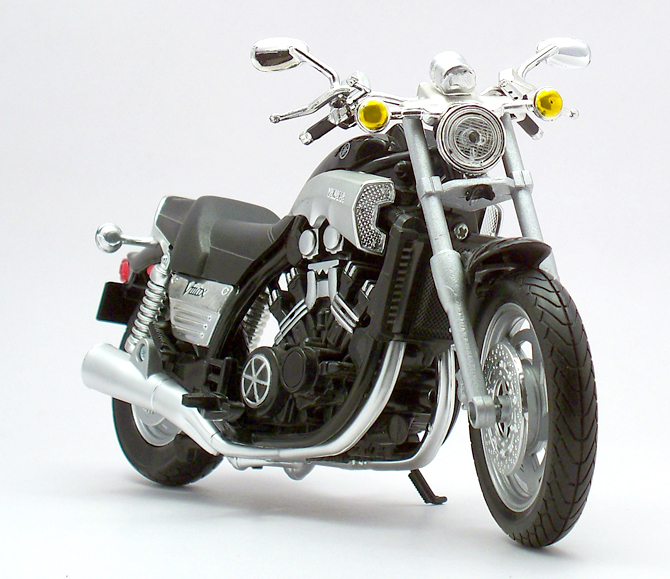 V-Max (not V-Max) short for Velocitus Maximus is a cruiser motorcycle made by Yamaha since 1985, known for its powerful V4 engine, shaft drive, and distinctive styling. The V-Max was noted for its quick acceleration, but was also criticized for its poor cornering ability and soft suspension. Powered by a 1197 liquid-cooled V4 producing 113hp of power delivered to rear wheel through a shaft. 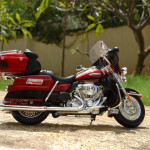 Till 2007 V-Max was almost the same as the original 1985 version with minor freshening apart from the V-Boost System that added 10 percent to the top power rating, larger-diameter fork to minimize high-speed wobbling and drift and four-piston brake calipers. 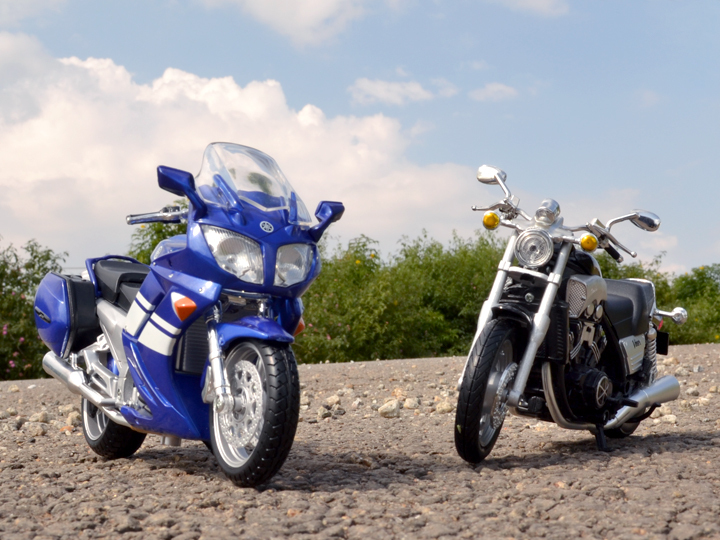 The FJR1300 is the largest sport touring motorcycle currently produced by Yamaha; launched way back in 2001 Europe and 2002 in America in different variants such as FJR1300, FJR1300A and FJR1300AS/AE. 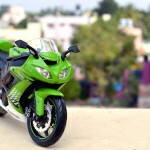 The bike came with ABS and few other are also kited with semi-automatic transmission controlled by a electronically controlled clutch. Powered by a 1298cc inline four cylinder engine mated with a 5-speed gear and had shaft drive in place of conventional chain drive. 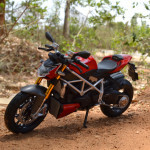 It included features like 3-way adjustable handlebars, seat height adjustments and few model featured heated handlebar grips with speed sensitive adjustment. 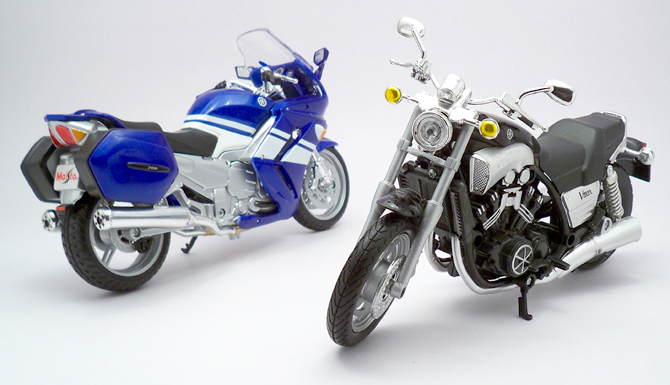 As these are not real bikes (1:12 diecast models) I cannot run tests like performance, creature comfort, handling so I am going to compare them in terms of aesthetics, fit and finish, features and appeal. 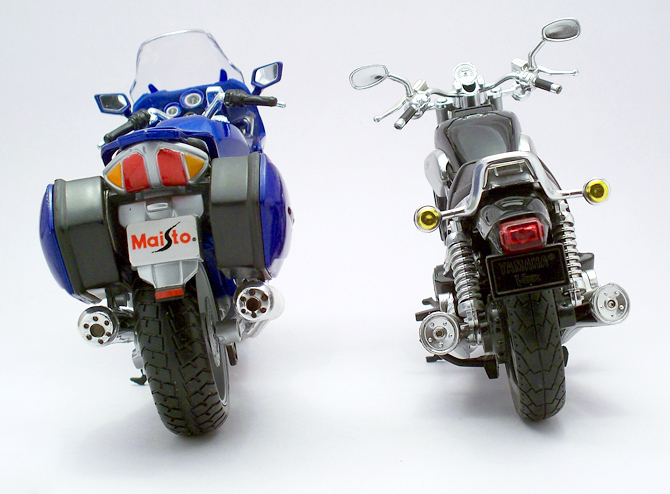 Both these models fall into a same bracket of budget models; V-Max made by NewRay and FJR1300 made by Maisto. 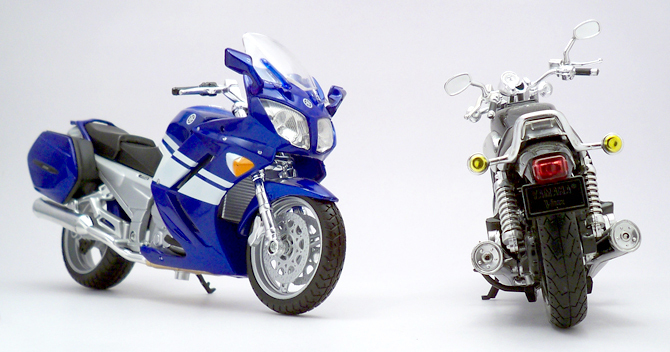 As far as the aesthetics both the models are in par were the V-Max get a niche of advantage. 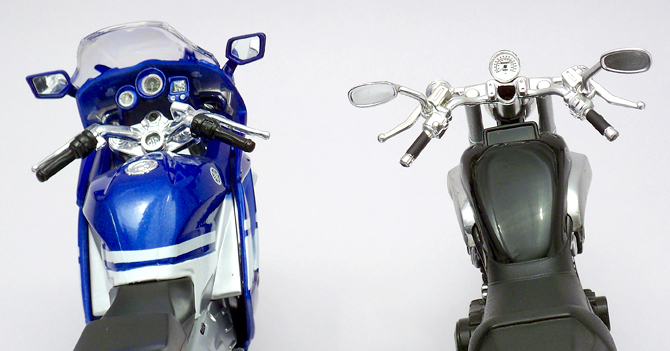 The V-Max leads the fit and finish round by a large margin, thanks to the chrome bling parts and neat glossy paint job. Paint job on the FJR1300 is also nice but the decals are too blurred and smudged all over killing the otherwise nice bike. Excess gaps between panels and not intuitive turn indicators get this big guy low scores. On the other hand V-Max’s minimal body parts that too in black hides the misalignments to a very level resulting in good scores. Both these bikes are fat and scaling is perfect not much has gone wrong. All the body parts, exposed cycle part like front forks, rear suspension (only V-Max) handlebar size are all nicely synced with each other. I expected way better results from the Maisto but unfortunately no magic. The FJR has a working suspension which is not an option in the NewRay’s V-Max. The handlebar and speedo dials on the FJR are little quirky which let the other Yamaha with very neat yet minimal instruments take on. If these bikes are kept apart and view/review separately, they will end up in an identical rating but together it is obvious that the V-Max is far more sexier and more appealing than the FJR. 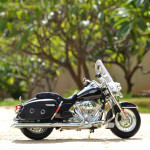 FJR is perfect but it’s all covered body and uninspiring lines could not keep up with the radical and uber cool V-Max. So we have a winner!